Philadelphia Eagles right tackle Lane Johnson lays a block to free running back Darren Sproles on his 25-yard touchdown run. 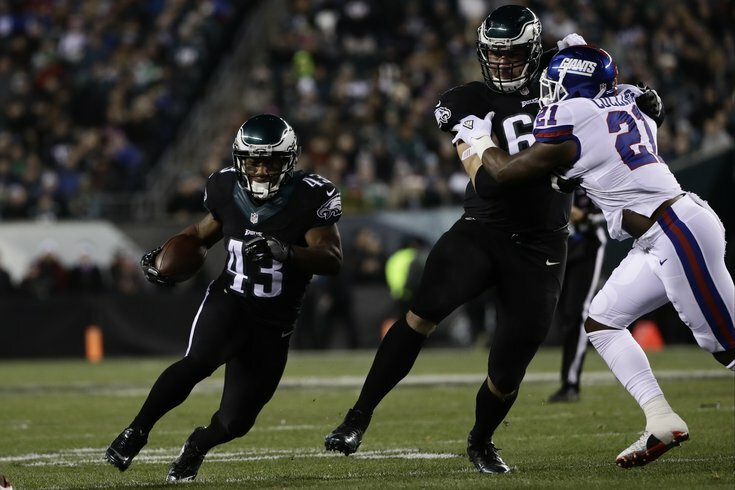 The Eagles wasted no time getting the scoring started in Thursday night’s 24-19 win over the Giants, marching 78 yards down the field on their opening drive, which was capped off by a 25-yard Darren Sproles touchdown run. The Eagles did so largely on the ground — they ran for 62 yards on that drive, including two runs of 17-plus yards — and much of their rushing attack was behind the lead blocking of right tackle Lane Johnson, playing in his first game since the conclusion of a 10-game suspension for a second failed PED test. "I think [head coach Doug Pederson] wanted to see me and [RG Brandon] Brooks work together right out of the gate and see what worked from there," Johnson said. The Eagles wasted no time checking to see if there was any rust, as Ryan Mathews picked up 17 yards behind Johnson's blocking on the first play of the game. "We started off the game with a boom," Johnson said of his block on the Mathews run. "First play of the game, he just kind of picked up where he left off," Pederson said after the win. "He did a great job on that first play. He was out running. I thought his pass protection was good. Of course, we'll sit down and watch the tape tomorrow and evaluate it even further. But that was a great addition to get him back." It was nice to see. It was also extremely frustrating. See, the Eagles are now 4-1 in the five games Johnson has played this season — they could be 5-0 in those games if not for Ryan Mathews’ horrendous fourth quarter fumble against the Lions — and 2-8 in the 10 games he missed. And you can't help but think how this season may have gone had Johnson never been suspended. I’m not about to suggest that one offensive lineman can be the difference between the Eagles being 6-9 and them potentially being 9-6, but it might not be as far off as you think. If you’re willing to concede that when Johnson isn’t suspended he’s one of the best right tackles in the league, or at the very least a really good one, then you also have to be willing to concede that there's a drop-off in talent when he's not out there. No offense to Halapoulivaati Vaitai, Isaac Seumalo and Allen Barbre, who held their own, especially after their loss to Redskins in their first game without Johnson, but they're just not quite on the same level. "We felt going in that we could be a little more balanced left and right with the running game than, say, in weeks prior [since Vaitai went down]," Pederson said of the decision to run behind Johnson, especially early. "Nothing against Isaac [Seumalo]. I thought Isaac did a great job in Baltimore, and Allen [Barbre] did a great job for us a right tackle. "But a lot of times I call runs behind our Pro Bowl tackle over there, Jason Peters, and we also wanted to find out where Lane was at a little bit too, to get him in the flow of the game. Just so happened that a few went his way." By the end of the night, the Eagles had rushed for 118 yards against the fifth-ranked Giants run defense -- despite being without Ryan Mathews (stinger) for much of the fourth quarter. But Johnson didn't just have an impact on the ground game. Rookie quarterback Carson Wentz, who wasn't sacked but did leave the game for a bit after taking a late hit from Olivier Vernon, was also happy to have his starting right tackle back. For proof of that spark, look no further than the 6.2 yards per play the Eagles averaged against the Giants, their most since Week 2 when they averaged 6.9 in their 34-3 win over the Steelers and well above their season average of 5.0 yards per play. The Eagles averaged 4.8 yards per play in the 10 games without Johnson compared to 5.8 yards per play in the five games with him in the lineup. One yard may not sound like much, but that's a big difference. It wasn't a perfect game for the former fourth-overall pick, and there were a few moments when the rust still left from the past two and a half months showed itself. But the good certainly outweighed the bad. During his absence, the Eagles’ eight losses came by an average of 6.7 points. They averaged nearly 20 fewer yards of offense per game. And in several of those loses, it was a play here or there that made the difference. Prior to beating the Giants, they were 0-6 in games decided by seven points or fewer. "Crowd. Defense. Made some plays in the passing game down the field and took advantage of some situations," Pederson said. "And I can't say enough about Malcolm [Jenkins] tonight. The pick-six was huge, then another interception. Terrence [Brooks] there at the end. Big interception and the stops by the defense. "I mean, just offensively doing enough in the run and pass game to sustain some drives and score. ... Just all in all, was it perfect or pretty? No, but just a great team effort and a great team win." If the Eagles had Johnson available all season, that wouldn't have magically fixed the team's other issues -- like a lack of talent at the skill positions, a secondary that can be suspect at times, and rookie head coach still learning on the job. Against the Giants, however, that seemed to be the case. Nelson Agholor caught a 40-yard touchdown pass, albeit after an egregious drop. The defense had three interceptions, the first of which Malcolm Jenkins returned for a touchdown and the last, a game-sealing INT by Terrence Brooks. Then again, they gave up 470 yards of offense to Eli Manning and the Giants offense. And Pederson actually won both of his challenges, even though nearly got his previously-injured franchise QB killed (and don't even get me started on that deep throw on 3rd and 6 late in the fourth quarter). So maybe it wasn't the return of Lane Johnson that made it feel like late September at The Linc on Thursday night. Maybe it was the winning. However, there's little doubt that having their starting right tackle back helped the Eagles pick up not just their first win in a close game, but also their first win over a division opponent. You can't help but wonder what might've been had Johnson not been suspended. Lane Johnson, joking, said he considered holding up a sign that said "I'm sorry" when he ran out of the tunnel tonight.